The "Wishbone TM " safety device Model P.E.R.T.S. 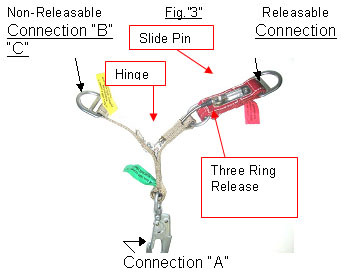 TM (Personal Emergency Release System), is a "Y" lanyard type device with two legs for the connections of positioning lanyards of which one leg is automatically releasable when there is a predetermined load spreading the two lanyard connecting anchor points apart. The third end is a swivel double locking snap for connection to a personnel body harness. All webbing and components used in these devices meets or exceeds ANSI Z359.1.1992 Standards. Capacity: 310lbs. maximum personnel load including equipment. The Wishbone TM device intended use is the ability to secure personnel loads by connecting to two anchor points at the same time, one anchor point being a non-movable anchor point Permanent Structure and the other anchor point being a movable anchor point Aerial Lift . 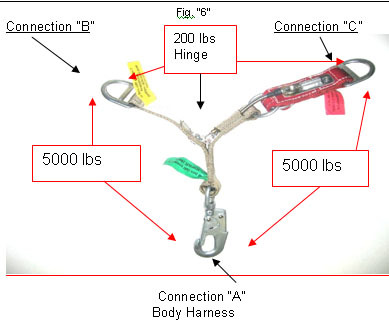 The primary purpose of this configuration is, if for any reason the movable anchor point fails or moves away while the worker is Transferring to or from the Aerial lift or while working at that location, the Wishbone TM will release from the movable anchor point while maintaining connection to the non-movable anchor point and supporting the Authorized Person/End User. The primary purpose of this configuration is, if for any reason the movable anchor point fails or moves away while the worker is Transferring to or from the Aerial lift or while working at that location, the Wishbone TM will release from the movable anchor point while maintaining connection to the non-movable anchor point and supporting the Authorized Person/End User.